Recirculating Farms Coalition in cooperation with the USDA Farm Service Agency is hosting a series of outreach and discussion sessions for farmers in New Orleans, Louisiana and beyond. We are planning to have classes throughout the summer on topics that will provide training and information on how to participate in various federal farm/farmer support programs, such as getting insurance and applying for funding, equipment and other assistance. 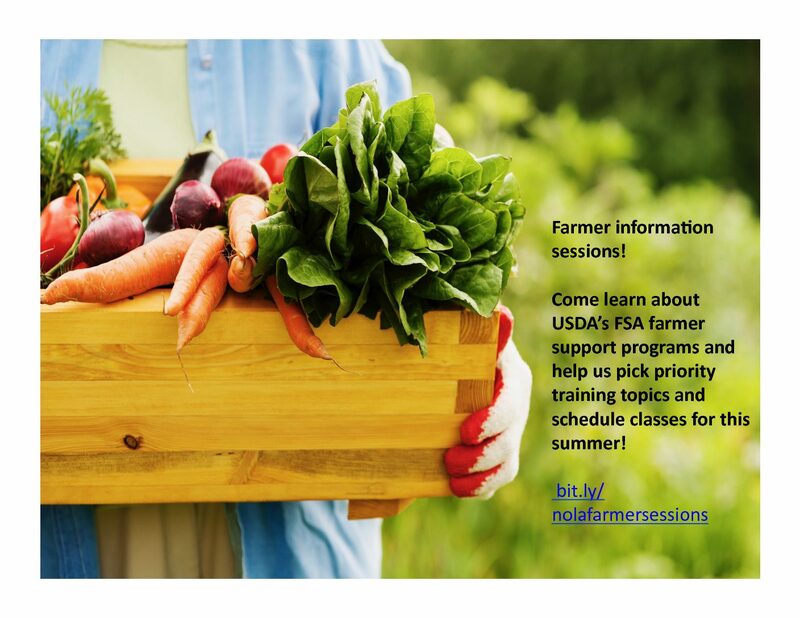 At these July meetings, we will review and select which topics are most important to our community and schedule dates and times for the classes, so the most farmers are able to participate. Help us support growers! Hope to see you at one of these meetings to provide your input. Snacks and drinks served. Big thanks to all the above venues for providing free or very low cost space to make such events possible. We appreciate your generosity and support!